Blue Fang (Ephebopus cyanognathus) N2′s pulled 5 weeks. I usually prefer to leave them longer but lost my nerve after all the hot weather we have been having. Sangihe Island Black (Lampropelma niggerimum) Young hatched out at n2! Feather Leg Baboon (Stromatopelma calceatum) Haven’t even bothered counting the slings, there are lots and I think another female has produced a sack, I feel a special offer coming on for these! 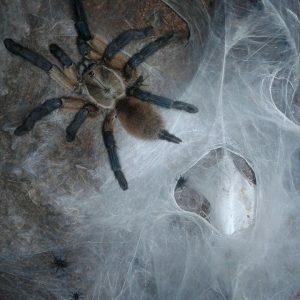 Blue Velvet Pink Toe ( Avicularia sp. “Blue Velvet”) Small eggsack only 9 young, maybe I would of been better artificially incubating rather than leaving with mother.